Kyle Scadlock ’19 returned from a torn ACL to score 26 points in a Nov. 17 game against Salem State, his first contest in 11 months. Photo courtesy of the Berkshire Eagle. On a cloudy December evening in 2017, 300 fans piled into the Woodward Center as Westfield State hosted Williams in a non-conference matchup. All eyes from the Westfield State sidelines focused on Kyle Scadlock ’19, the 6-foot-7 forward who helped lead Williams to an improbable Final Four run the year before. 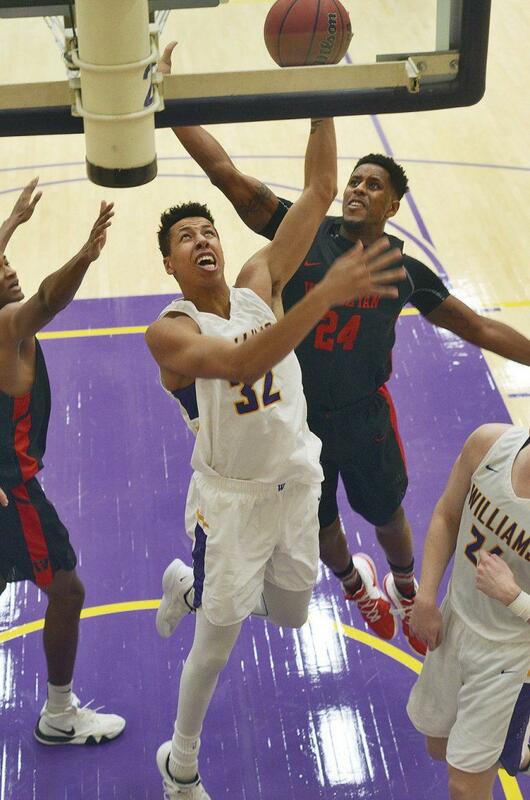 Averaging a NESCAC-leading 20.7 points and 9.5 rebounds six games into the season, Scadlock had quashed any doubts that he was the Ephs’ go-to option. Late in the first half, however, those same eyes were trained on No. 32 for a different reason. During a routine baseline out-of-bounds play, Scadlock took a bump while receiving the pass and crumpled to the ground in intense pain. Scadlock didn’t want to think about the last time he had felt his knee pop out of place, but the similarities between the two moments were too great to ignore. Three years earlier at Cleveland University School in Hunting Valley, Ohio, Scadlock was ready to spend the last year of high school playing with some of his closest friends. But during the bus ride home, Scadlock felt his knee swelling and stiffening enough that he went to get an MRI. Lipford wasn’t wrong. 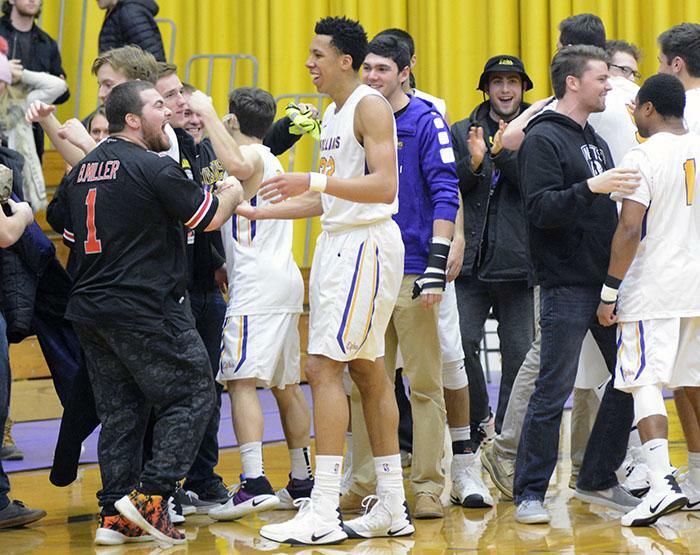 On Nov. 20, 2015 – after nine exhausting months of rehab – Scadlock debuted as an Eph, scoring 14 points in 18 minutes off the bench. Late in the game, he threw down an emphatic two-handed dunk to put the Ephs up five, proving not only to the crowd but also to himself that he was as explosive and athletic as ever. It took only three games for Scadlock to crack the starting lineup, where he would remain for the rest of the season. By his sophomore year, Scadlock’s knee injury was long behind him. The Ephs put together an inspiring NCAA Final Four run, and Scadlock saw the opportunity to take on a larger offensive role, averaging 15.1 points during the tournament. Back at Westfield State on that December evening, Scadlock limped off the court and boarded the bus home. It was a win on the scoreboard, but the team atmosphere was somber. Scadlock sat icing his knee on the bus ride back to Williamstown with a growing fear that it was a severe injury – a feeling eerily reminiscent of that silent ride back from the high school scrimmage. A few days after an MRI, Scadlock was limping through the halls of Lasell Gym when his phone buzzed in his pocket. He picked up and heard his doctor going over the results. Scadlock tried to listen, but two words kept echoing in his mind – two words that ended his season three years ago and would end his season once again. Torn ACL. Scadlock hung up and laid down by the stairs of Lansing Chapman Rink, staring at the ceiling. At that moment, he could not have felt more alone, with only the hum of the nearby vending machines to comfort him on the cold cement. Still lying by the stairs, Scadlock tried to come to terms with the reality that his goal now was not to advance past the Final Four, but instead to get through another nine months of grueling physical therapy. While Scadlock dealt with his personal struggles, the team also had to find a way to fill a void of 20 points and 10 boards every night. “I think we all realized that when you lose a player of Kyle’s caliber, you all have to step up individually,” James Heskett ’19 said. “We had to come together and find time for a new identity and have some people step up… We grew a lot as a team from that.” In the absence of Scadlock, Heskett would put together an All-American season, and Bobby Casey ’19 would earn All-Northeast honors en route to a NESCAC title and a second-round NCAA tournament appearance. In the next three months, the Ephs would rattle off 17 wins in 22 games. Sitting at the end of the bench practice after practice and game after game, Scadlock found other ways to contribute. “He was one of those guys that admits the struggles he was going through and really stayed positive,” Heskett recalled. During practices, Scadlock stayed engaged in the team’s strategy, pointing out the weaknesses of the opposing defense and analyzing particular plays as his teammates came off the floor. Scadlock thought back to all the days he spent alone in physical therapy and rehab. All the days he sat on the bench while his teammates put up shots and ran through drills. All the days he wished he could be out there shooting and dribbling. Fast forward to the present. Scadlock warms up against Salem State on Nov. 17 – his first game in 11 months. He looks over at the Salem State sideline and catches glances directed at not only him, but Heskett and Casey as well. He comes out aggressively, knocking down a couple 3s and earning 17 free-throw attempts. Playing 30 minutes, Scadlock would lead the team with 26 points, putting his name back on the map. After making the Final Four in 2017, the 16–2 Ephs have their eyes on this year’s Div. III national title. Photo courtesy of Sports Information. Something else is different as well. When the phone rings, Scadlock is no longer afraid of hearing those two dreaded words: Torn ACL. He’s experienced it. He’s recovered from it. And now he’s ready to move on.